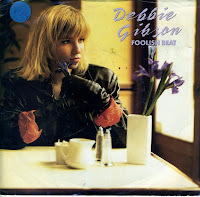 At the age of 17, Debbie Gibson was the youngest female to write, produce, and perform a US Billboard Hot 100 number 1 hit single with her song 'Foolish beat'. In the UK, the single reached a peak position of number nine on the UK Singles Chart. The song was included on Gibson's debut album 'Out of the blue', released in 1987 as well. Debbie Gibson was born on August 31, 1970. Aged just sixteen, she debuted with the single 'Only in my dreams' and the album 'Out of the blue'. In America, she was presented as the 'good girl' as opposed to 'bad girl' Tiffany, who was of the same age.